Every once in a while, you might see a post on Facebook or Twitter talking about the shocking conditions of the modern animal research lab. It’s true. I’ve been in many animal research facilities. It would shock you. But not in the way you’d expect. First of all – they are amazingly clean. Cleaner than my house, that’s for sure. In most of them, you actually have to put on PPE (personal protective equipment) in order to go into the lab. This is not to protect you from the animals; it’s to protect the animals from you. Odds are you have way more germs and bacteria than the animals inside. The next thing you notice is how orderly things are. Every part of the animal facility is very neat and organized so that the animals can be cared for properly. It’s also very quiet, because noise can stress the animals. There are cages of rats and mice, in clean bedding, with fresh food and water. You’ll see skilled, certified vet techs taking care of the animals in their cages. You’ll see cagewashers cleaning the cages and replacing bedding (usually some sort of shredded paper or pellets) on a regular basis. You’ll see veterinarians providing medical care to all the animals. In fact, you’d be amazed how many people you see working in the lab – all of whom care greatly about animals. 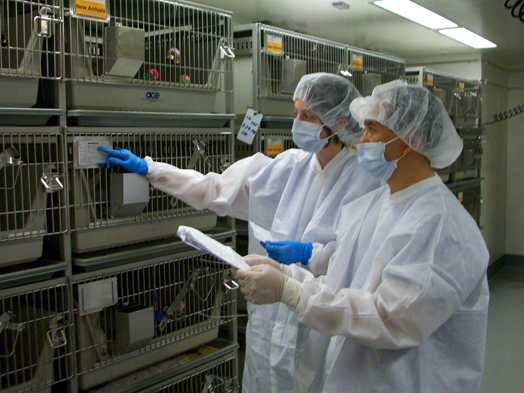 I’ve seen other animals in the lab too – cats, dogs, monkeys, guinea pigs. All taken care of by vet techs, veterinarians, and other animal care staff. In fact, the cats, dogs, and non-human primates are required by law to have specific housing conditions, socialization and enrichment. Sometimes, volunteers come in just to play with the dogs. After all, it makes sense. Happy, well-cared for animals mean better research results. Anyone who tells you that an animal research lab is dirty or that the animals aren’t taken care of has clearly not actually been inside of an animal research lab. I would know – I’ve been there.